Arsenal, who had gone 18 games unbeaten in all competitions, hosted the high flying Spurs at home. 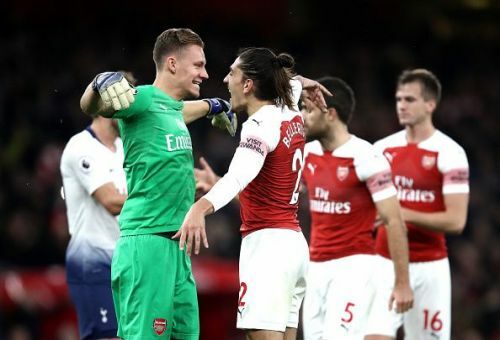 The North London Derby as it is called, was played for the first time with Unai Emery as a coach. The Gunners came into the game with their first team well rested from a game against Vorskla. Spurs, on the other hand, were in the midst of a tight schedule, facing Chelsea last weekend and Inter mid-week in the Champions League. Having failed to win 7 out of the last 8 Premier League games against Spurs, Arsenal had something to prove in this game - that they can win the North London Derby convincingly. It has to be said they did that with perfection. Unai Emery stuck with his three-man defense with Sokratis, Holding, and Mustafi. Bellerin and Kolasinac were pushed up as wing-backs with Xhaka and Torreira in the double-pivot. Aubameyang, Iwobi, and Mkhitaryan completed the front three. Tottenham stuck with young Juan Foyth in the center but changed his partnership, pairing him with Vertonghen. Aurier and Ben Davies continued to start. Eriksen, Dier and Moussa Sissoko lined up in the midfield. Kane, Alli, and Son completed the Spurs' front three. Arsenal drew first blood in the game with Pierre Emerick Aubameyang scoring from the spot. Tottenham struck back with Eric Dier, whose "stay quiet" signal to Arsenal fans caused quite a stir among the Arsenal substitutes. A minute later, Harry Kane converted from the spot to give Tottenham the lead going into half-time. Aubameyang brought things back on level terms with a stunning strike in the second half. Goals from Lacazette and Torreira in quick succession put the game out of Spurs' reach. Arsenal is now tied with their neighbors with 30 points but they are ahead on goal difference. They are only one point away from their other neighbors Chelsea in the table. Here are the major takeaways from the game. With fixture congestion being a major part of the Spurs' schedule, and the need to play the best 11 both in the league and in Europe, Pochettino had to rotate his squad. He had rested Juan Foyth for the Inter clash and had one of his center-backs rested. 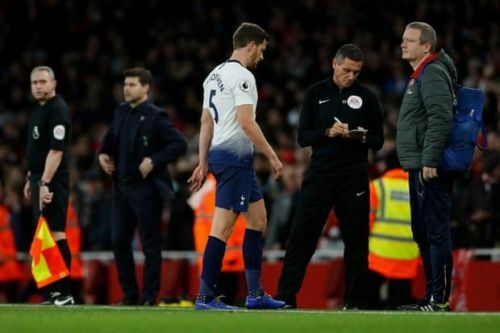 Even though Pochettino started Foyth, he changed his partner from Toby Alderweireld to Jan Vertonghen. The possible gamble backfired on the Spurs, and it was showing from the first minute. Spurs lacked the communication in defense, possibly due to the sparse amount of time that Foyth and Vertonghen have played together. The events turned bad for Vertonghen in the 10th minute itself. While defending a corner, he raised his arm insanely high and Mike Dean spotted it. Arsenal won the spot kick and went ahead through it. Even after it, Vertonghen had a lackluster night, winning only one aerial duel and two tackles. He failed to cut off the pass from Bellerin to Ramsey and failed to foul as well. The move culminated in giving Aubameyang his second goal. To round up his already horrific night, he was shown a second yellow and a red by Mike Dean for his poor tackle on Lacazette. A bad gamble was taken by Pochettino and was extremely demoralizing for the Belgian.